I for one, am thankful to see this build. Mike, your work is an inspiration to me. Watching this build has given me the inspiration to work through my recovery and get on with some of my projects. Keep it coming! Thanks Dave, I hope the recovery is going well. You have been out for quite some time. Oh I know its frustrating!... but its coming along. And i know i have an even bigger project after! After a long winter's hibernation, it's back to work on the Jupiter. 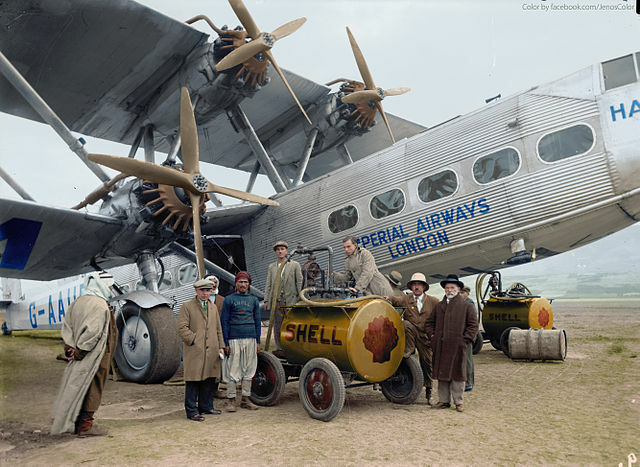 The Bristol Jupiter engines were used to power many different aircraft types in the late 1920's, ranging from military fighters and bombers, to commercial transport and large passenger airliners. Bristol's offered several methods for starting the Jupiter engines to cater for the many different aircraft installations. Remember, these were the days before electric starters were available. When the engines were mounted in the nose or lower wing, access was easy, so a motor vehicle fitted with a 'Huck's Starter' could be employed. A high level shaft from the 'Huck's Starter' vehicle was attached to a jaw coupling on the propeller hub to turn over the engine. This was a quick and easy way to start the engines at their home base but different arrangements were needed when the aircraft landed at an airfield without a 'Huck's starter' available for use. The big Handley Page HP42 airliners, operated by Imperial Airways, presented a unique engine starting problem due to the height of the upper engines above the ground. A special air starter system was designed specifically for these difficult installations. Compressed air from a special 'air starter rig' was used to turn over the engines during start up. The 'air starter rig' contained a petrol engine driven compressor, a large air reservoir and a crude carburettor to add fuel to the starter air supply. The engines were fitted with an air distributor not unlike an ignition distributor. 'Air starter rigs' would be located at each stop on the scheduled route. For the model Jupiter I decided to use something based on the 'hand turning gear'. I plan to use a cordless drill/driver for engine starting with a simple Jaw coupling between the drill and the engines input layshaft. The cordless drill's gearbox would provide the required speed reduction, so eliminating the need to replicate the double bevel reduction gears of the full size 'hand turning gear'. A dummy, non functional, reproduction of the original 'hand turning gear' would be added for appearance sake. I made two jaw couplings (one as a spare) and a bidirectional coupling intended to allow the crankshaft to be rotated in either direction, during the later stages of the build. Here is the rear cover of the engine, showing the jaw coupling mounted on the input lay shaft, together with the 16 tooth input pinion. The rear cover contains the 'hand turning gear' , the pressure and scavenge oil pumps and the drive to the twin magnetos. I don't know how many of you are still following this build. Sorry about the slow rate of progress. Here are the two halves of the Hand Turning Gear Housing being machined. The six bolt holes were a very convenient way to hold the parts onto a backing plate. The inside and outside faces of both components were machined without disturbing this setup. Part way through the machining. The two parts have been machined from five sides.The rearmost flange (side six) is still a rough square. The rear flange is faced of to length and profiled to shape. The mounting holes are coordinate drilled and tapped 8 BA, without disturbing the position of the part. The machine work on the Hand Cranking Gear casings is complete and will be followed by some careful hand finishing of the less accessible parts and to make them resemble a casting. Still here, & still watching Mike! Another one quietly following your progress. Great work Mike, enjoy seeing your progress! Come to think of it - I do have one now as I can't see much missing at all - are you close to first pop or ? Its always nice to see an update on this beautiful engine. Very nice work as usual. When you talk about a hand crank starter. I have visions of this video of starting a tank. I can just picture those poor suckers that had to wind up these cranks to start those Jupiter's. Oh, every time I see you have posted on the Jupiter I'm on it. Count me in! The has been harvested so I don’t need ration it for quite awhile at least! I'm definitely following along...just lots of distractions here Nice work Mike!! Yet another one here quietly following along in awe. Still watching Mike, with big interest.